"E.K. Nyame was born in 1927 in Ghana. He revolutionised West African music in the 1950s, as he not only updated the Highlife music of the Palm-Wine groups, but also combined it with the acting of the local concert groups" (John Collins, African Pop Roots, The Inside Rhythms of Africa, 1985). This may still sound a bit vague, but I gather that E.K. Nyame played a major part in getting rid of western ballroom music (foxtrot, quickstep, waltz etc.) in concert parties and gradually replacing it with highlife music based on the guitar music of the palm-wine bars. He also slowly introduced more Twi into the shows. It is not surprising that he became Kwame Nkrumah's favourite musician. E.K. in turn supported Nkrumah in songs and plays. He told John Collins he had composed 40 songs in praise of Nkrumah. With the decline of Nkrumah's rule in the 1960s, E.K. 's songs were used by the opposition. E.K. Nyame died in 1977. Many thanks - these are lovely. These are fantastic. What are the release dates? 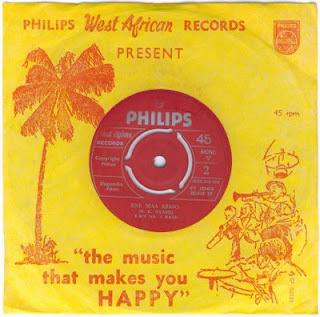 Interesting to see this pic...I have Nigerian 78 rpm records of the Philips label, with the same design, both in cover and label. Also, I have some 78´s of a "EK Band", but in the rival Decca label....is it the same group? La magnifique chanson Ene Maa Abaso m'a directement fait penser à l'excellente version "Si Si Ye" de Mar Seck avec l'Etoile de Dakar.